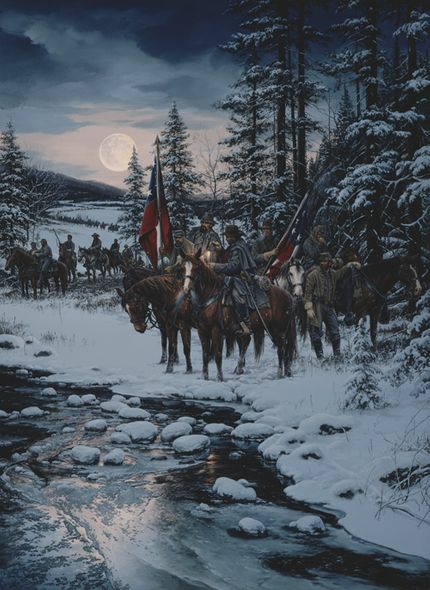 John Paul Strain Hand Signed and Numbered Limited Edition Executive Canvas Giclée:"Snow Moon"
Image Size: "29.5" x 40"
Edition: Signed and Numbered Giclee - edition of 25 with 5 AP's / Canvas editions. About the Art: It was one of history's great escapes. Facing a superior Northern army, the commanding Confederate officers at Fort Donelson had decided to surrender their pivotal post-opening the Southern heartland to Northern invasion. One Confederate commander, however, refused to give up. "I did not come here for the purpose of surrendering my command," vowed Colonel Nathan Bedford Forrest, "and I will not do it if they follow me out." They did. Slipping through the winter darkness, Forrest and his troops made their way through the snowy Tennessee Countryside. By the evening of February 17th, Forrest and his command were safely away from Fort Donelson and the Federal forces that had captured it. His determination to resist capture and continue fighting was characteristic of Nathan Bedford Forest. The poorly educated son of a Tennessee blacksmith, Forrest had no formal military training when the war began. He was a natural leader, however, and displayed a single minded understanding of the fundamentals of warfare. "War means fightin'," he would say, "and fightin' means killin'." He had nothing but contempt for fighting by the book and cared little for West Pointers. "Whenever I met one of them fellers that fit by note," he once said, "I generally whipped him before he got his tune pitched." After his escape from Fort Donelson, he distinguished himself at the battle of Shiloh; whipped a superior force of Federal cavalry into a panicky retreat at Brice's Crossroads; inflicted a humiliating defeat on the Federal navy near Johnsonville, Tennessee; and conducted a series of spectacular cavalry raids. General William T. Sherman urged that he be "hunted down and killed if it costs ten thousand lives and bankrupts the federal treasury." Repeatedly, however, Forrest survived battle, wounds and controversy to become famous as the Confederate "Wizard of the Saddle." By war's end, he had risen in rank from private to lieutenant general. Years later, viewing the war in retrospect, even General Sherman had praise for "that devil Forrest." The "most remarkable man our Civil War produced, "Sherman declared, was Nathan Bedford Forrest. -J.P.S. No thank you, I just want the 29.5x40 unframed Canvas.